Habit Droid aims to address the biggest obstacle that busy individuals face in developing new habits: long-term consistency. It is based on the idea that because our phones are always with us, the phone is the best platform for consistency-based productivity software. The user inputs the habits he or she would like to develop. I.e. to go to the gym every weekday, and to study for a certification every Saturday. 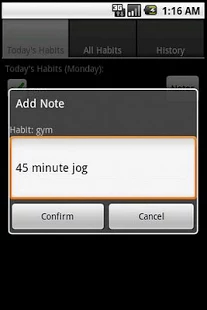 Every day, Habit Droid reminds the user of the habits that he or she needs to enforce on that day. 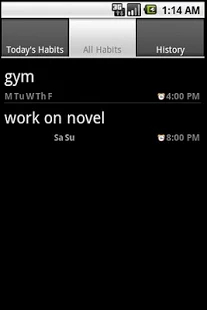 The user then inputs whether he or she has enforced each habit on that day. 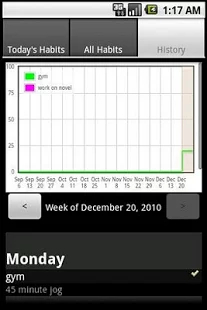 Habit Droid shows the user a graph representing the long-term history of each habit. It also provides a day-by-day breakdown of the user’s history. These features will help the user track his or her consistency over the long-term.